Johann Philip Wendel, wagon maker from Framersheim in the German Rhineland, and his wife Margaret (Thiehl/Diehl) brought their three sons Valentine "Felty", Augustinus, and Christophel "Stoffel" first to Pennsylvania, and then to the North Mountain tract of what is now Shenandoah County, Virginia. The name of Augustine Wendel is clearly found on the passenger list of the ship Samuel, arriving at Philadelphia on August 17, 1732. We presume the rest of the family was on the same ship, or else came earlier, although the other names are not found. Philip is documented to have made a land purchase from Jost Hite in 1737, while traveling south with his sons from Pennsylvania into the Shenandoah Valley, and part of the payment was later made with wagon wheels. The three brothers took the oath of allegiance to the British Crown on May 5, 1747. Their land plots on the North Mountain, just west of Toms Brook, are depicted in the book The Planting of New Virginia by William R. Hofstra (Johns Hopkins University Press, 2004). In addition to the Hites and a few other German-speaking families in the Opequon settlement, in the area of their new home the Wendels also found some of the Germanna colonists and their children, who had migrated north from the original 1714 settlement on the Rapidan to what is now Germantown, Fauquier County and further west. Christophel Wendel married Maria Catherina Brombach, daughter of Germanna colonists Melchior and Elisabetha (Fischbach) Brombach. Other German-speaking families in the valley intermarried with the Wendels, including Bücher/Booker, Döllinger/Dellinger, Dietrich/Deadrick, Graf/Grove, Haus/House, Hatzenbühler/Hotsinpiller, Krahenbühl/Craybill, Lochmiller/Lockmiller, Neuschwanger/Niswonger/Niswander, Otterbach/Otterback/Utterback, Pfeiffer/Pifer, Sanner/Sonner, Schnepp/Snapp, Swartz, and Wolfe. The three Wendel sons each raised a large family, with sons and grandsons serving in the Revolutionary War, and then migrating southwest down the Valley to Lexington and on into East Tennessee, and also west across the Appalachians to the Ohio and Indiana territories at the beginning of the 19th century. A Samuel Wendel who is presumed to have come from the same area of the Rhineland arrived in Philadelphia on the ship Restauration on October 9, 1747. He proceeded directly to Winchester, Virginia where he married and raised his family. His wife, Margaret Becker, was a cousin of the Wendels of Toms Brook -- her parents were also from Framersheim. Samuel's location so close to the North Mountain settlement, and the relationship of his wife to the other Wendels strongly implies a family connection, but his German ancestry has not yet been found. In America, the Wendel surname lost its original German spelling, except for a branch at Murfreesboro, and is found today as "Wendell", "Windell", "Windall", "Windle", "Wendle", etc. 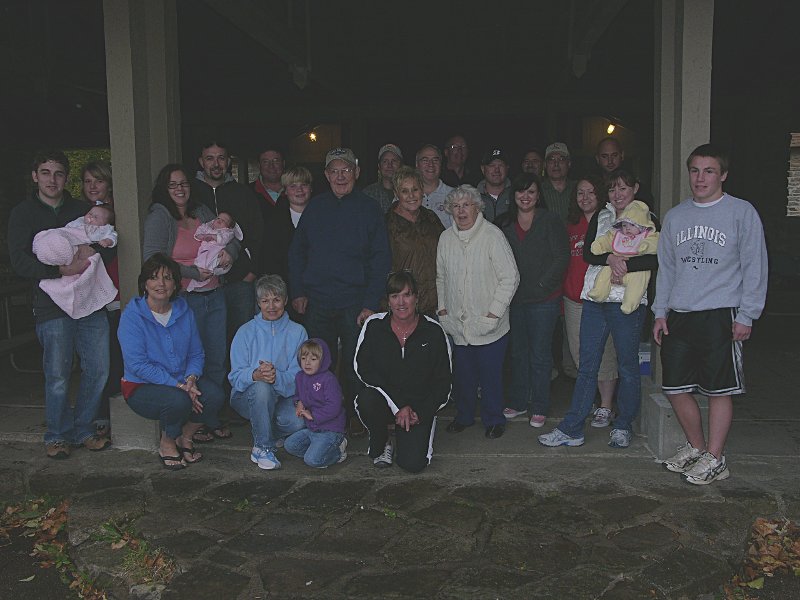 Reunion of children, grandchildren, great-grandchildren, and great-great grandchildren of Earl S. and Olive (Rodgers) Wendell, 2 OCT 2010 at General Butler State Resort Park, Carrollton, Kentucky.